Double Paradise is a spacious upper duplex unit located right on The Word's Most Beautiful Beaches! It has 5 bedrooms, 4 1/2 bathrooms, and beautiful large loft. Two master bedrooms, one overlooking the beach, have kingsize beds, both master suites have their own bathrooms. Three bedrooms with bathrooms hold 2 full size beds each. 1 queen and 1queen sleep sofa are located in the loft, which has a half-bath. 1 queen sleep sofa is located in the living room. All beds and sleep sofas accommodate up to 20-22 guests. The unit has a large living room, dining room, and kitchen with large counter space and bar stools. A large deck overlooks the beautiful Gulf of Mexico! A huge swimming pool for Double Paradise B guests is located right next to the unit. See photo. If more rooms are needed, please check the beach level unit of the duplex, listing vrbo #401068 for more details. Both units together sleep up to 36 guests. Linens and towels, silverware and cooking items, and appliances are provided for guests of Double Paradise B. Enjoy a memorable dream vacation with gorgeous sunrises and sunsets at Double Paradise, located on the World's Most Beautiful Beaches! Keywords: 2 Story Duplex, free wifi, Each Unit Rents Separately. This is the upper level unit which has 5 berooms,4 1/2 baths plus loft plus loft,sleep up to 20. If you need more room,please see other units we have available vrbo #401068 we do offer monthly rate for the month of January and February. The emerald water of the Gulf of Mexico is stunning against the World's Most Beautiful Beaches! We really enjoyed our stay. It was big enough for the whole family. Thanks Mcdaniel, We are so happy that you enjoyed your stay at our house. Wonderful experience - our hostess (Kay) was there for us if we had questions or needed anything! We were there for four nights with our softball team playing in a tournament. The house was very nice and in a great location. The balcony is large and has an awesome view of the beach. The rooms and bathrooms were also very nice and everyone was very pleased with our stay. We were right on the beach! There was plenty of parking and it was a great end to our season! Thank you so much Charles for taking your time to write a review. We do appreciate your input and I am so happy you enjoy you stay. I am so happy that you like our place and enjoy your stay.Thanks so much Debbie for taking your time to write this review. Our family of 17 , ages 3 to 76 thoroughly our stay--- enough to book it again next year. It has a large deck that could hold the whole family, a large living area and dinning area and parking for 5 vans and suvs. The owner was very accommodating. The only downside was the internet access which was very slow and the interior was a bit dated, but clean. we thoroughly enjoyed our stay. Swimming pool was a plus. Thanks so much for taking your time to write the review. We do appreciate very much for your input. Thanks again. Kay. Really great owner. 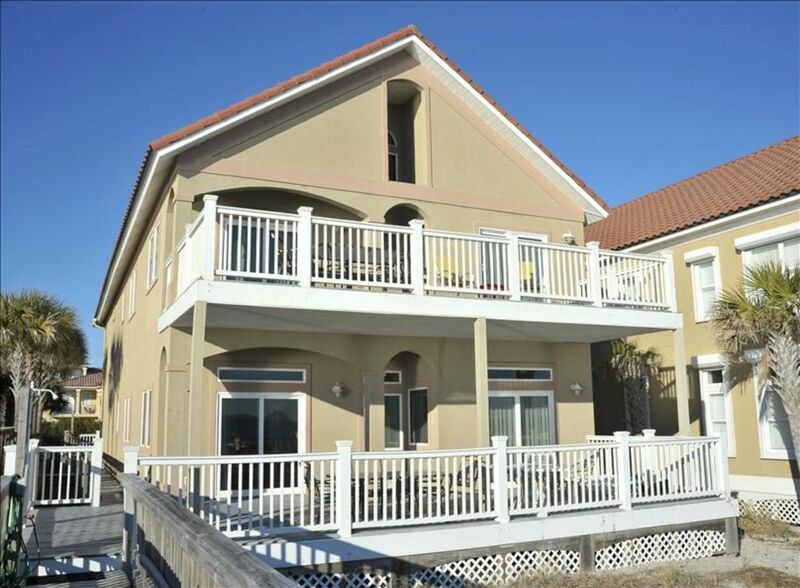 House is well taken care of, right on the nice quiet and private beach area. Pool next door is great too! Pictures don’t do it justice. Thanks so much for taking your time to write the review, I do appreciate it very much. Thanks again. Kay. Championship Golf Venues such as Camp Creek GC, a Tom Fazio design; Hombre GC, home to Second Stage PGA Tour Qualifying School; Shark's Tooth GC, a Greg Norman design; Bay Point Nicklaus and Meadows courses; and Regatta Bay GC, voted as one of the best courses in the area by Golf Digest are within close proximity to Double Paradise. September-November and April-May are ideal for golf. December-February is good for golf, with average temeratures in the low 60's. Panama City Beach has numerous outdoor concerts, festivals, car shows, sporting events, and other activities. Pier Park Mall offers numerous restaurants, shopping, 16 screen movie theatre, bookstore, and entertainment for children of all ages. Zoo World, Gulf World Aquarium; Shell Island Cruises; Frank Brown Park for tennis, basketball and swimming; and Ship Wreck Island provides for wholesome family activites.